Retaining walls are both practical and beautiful at the same time. Retaining walls are built specifically to stabilize sloping yards, and hold back ground that would otherwise descend downward and cause a decline. 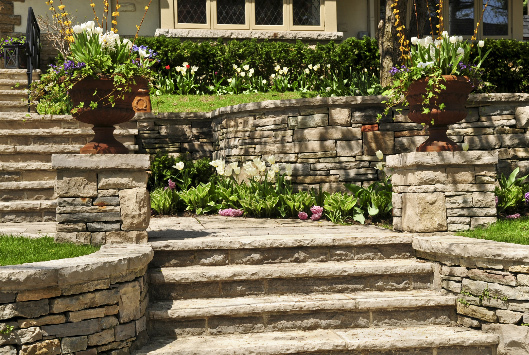 Retaining walls are not a landscaping feature that should be attempted by a novice. Because the natural tendency of the ground in question is to move forward and downward, the inherent design has to pay close attention to the physics of the land, and combat this movement. The longstanding success of a retaining wall is entirely dependent on the landscaper's ability to recognize, and work against these physics. At the same time, the retaining wall cannot just be a thing of mathematical calculations! Retaining walls are a thing of beauty and aesthetic design. Through careful selection, construction, and meticulous attention to details, a retaining wall doesn't just serve a major purpose - it can also be the conversation piece of your yard. With your input, we'll help determine the exact retaining wall for you. Each project is custom-created, with your property, your desires, and your aesthetic taste in mind. We'll give you access to a large variety of stone, allowing you to choose the type, color, and style you'd like. We'll consult you on popular suggestions, and show you examples of our work, so you can find the inspiration you need to achieve the look you're dreaming of. Our specialized expertise allows for the beautiful amalgamation of physics, math, and aesthetics. Let us use our skills to give you the yard you've been dreaming of. Allow our company to construct the retaining wall you're looking for.